Editor: George Mitrovich was the emcee at the Spring Valley Town Hall meeting with Rep Susan Davis on Aug. 29th. He is also the chair of the Democratic Party City Club. I thought of that story Saturday when I was driving to a middle school in the Spring Valley area of San Diego to moderate a “town hall” meeting on health care. Congresswoman Susan Davis, a Democrat from California’s 53rd District, had asked me to do that, and since my regard for Ms. Davis is very high, I readily accepted her invitation. I knew from reports that more than a 1,000 people were expected, and, given the demographics, it would most likely be an unfriendly crowd. In fact at breakfast that morning some friends told me to either “bag the meeting” or wear a “bulletproof vest.” But, wisely or otherwise, I went, confident of my ability to handle even the most hostile of audiences. 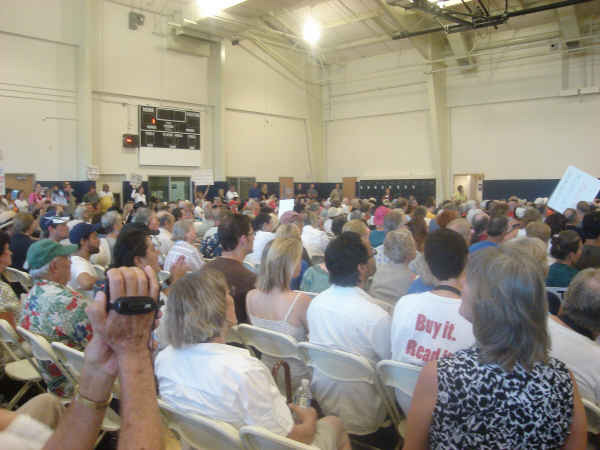 On a boiling hot day the audience in the school’s gym easily topped 1,000, an amazing turnout compared to the 40 or 50 who normally attend such meetings. In addition, the 40 San Diego County Sheriff deputies assigned to the event turned several hundred more away. Congresswoman Davis welcomed the crowd and invited the veterans present to come forward and lead the Pledge of Allegiance. More than 20 did. So far so good, I thought. Mitrovich describes this event as if all 1,000 attendees were right wingers. The pro-health care for all supporters clearly outnumbered the “just say no” contingent. His description is neither factual nor thoughtful- it perpetuates the image that these town hall meetings have been completely co-oped by the right. Not true. The media has focused on this segment almost exclusively. I would have expected him to get it right. It should come as no surprise to him that our Congresswoman, who read the bill and was prepared to answer questions about it, found herself in a room with so many people who felt not only entitled to their opinion but entitled to their own spurious facts and really didn’t want to hear anything she had to say. What this points out is that the left needs a new strategy. For starters, somebody ought to email George and give him all the links to all the fine (and contrary) reports here at the OB Rag, and CHALLENGE him to retract and revise a lot of his remarks. Plus, a copy of that email should be posted on the comments section following his article at the Huffington Post. If nobody else gets around to doing this before I do, I will. It will be later today or tomorrow, however, before I will have the time to round up all the links. I know this only a “sliver” of what we all need to be doing, but, in general, the left does need to work on education, and especially not allow people with any sort of progressive credentials to go around publishing falsehoods, without being corrected. We have enough trouble sorting out how to think about what to do, without adding false reports about events to the mix. I just posted this on Huffington Post as a comment to George’s article. My account there is new, so it may take some hours to clear and show. and I want to challenge you to read several other progressive reports and commentaries on the same Susan Davis town hall meeting. I propose that you publicly revisit your impressions and revise your article. All of these reports and commentaries were published in San Diego’s local OB Rag blog. The Right Wingers Are More Organized on Health Reform? Give It a Rest Already! Older Article: The Right Wingers Are More Organized on Health Reform? Give It a Rest Already!